After struggling to score over the previous three games, they Tigers returned to form against the Orioles on Friday and matched it with another good start from Max Scherzer (7-0, 76.1 IP, 3.42 ERA, 2.45 FIP, 2.7 WAR). Scherzer gave the Tigers 7 strong innings of 3 run baseball featuring 2 walks and 10 strikeouts, while retiring the final 16 he faced. It wasn’t quite as dominant as his previous two outings, but it was certainly very good and it was against a very strong offense. The Tigers offense came from Cabrera and Garcia HRs and Garcia and Martinez RBI hits and the Tigers almost got their 30th win, if not for the horrendous pitching of Jose Valverde. He entered the game in the 9th up 2 runs and allowed a homerun, a single, a single, a popup, a popup, and then a 3 run HR complete his meltdown. They’ll look to get back on track Saturday afternoon behind HR Derby hopeful, Justin Verlander (6-4, 66 IP, 3.68 ERA, 2.26 FIP, 2.5 WAR), who thankfully, will likely stick to pitching. The Moment: Cabrera starts the game off right with a 2 run HR. I haven’t spent enough time with these numbers to really know if it reflects the quality of the team’s third base coach, but I suspect it does. The coach can’t make his runners faster, but he can know which players are capable of taking the extra base and only telling them to advance. They don’t always listen, but a good third base coach should be able to make them. Seattle makes the highest percentage of their baserunning outs at 3B and home, so their coach could probably do more to help. Ideally, you would want to have all zeroes on this board, but the columns showing 3B and home are categories in which the coach plays a role and should therefore be judged. I’ll be thinking about this more and working on a way to further isolate this going forward. If you have suggestions, let me know. Another pitchers’ duel that needed a run. 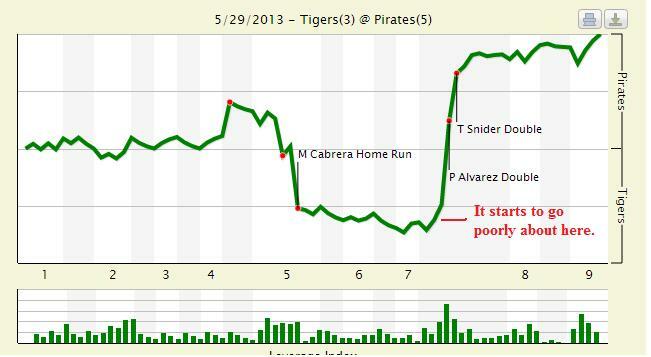 But this game was also another 0-0 extra inning affair that ended in the 11th inning with a Pirates run. With the loss, the Tigers fall to 29-23 and lose the four game set with the Pirates. They will head to Baltimore for three starting on Friday and will be led by Max Scherzer (7-0, 68.1 IP, 3.42 ERA, 2.39 FIP, 2.4 WAR) who is looking to build on a couple of excellent starts (see here, and also here). 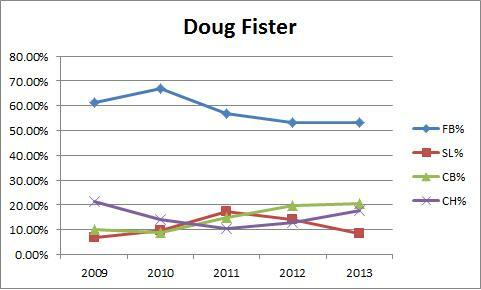 Fister’s great start also gives the Tigers 4 of the top 8 pitchers in MLB by WAR and 4 of the top 6 in the AL. 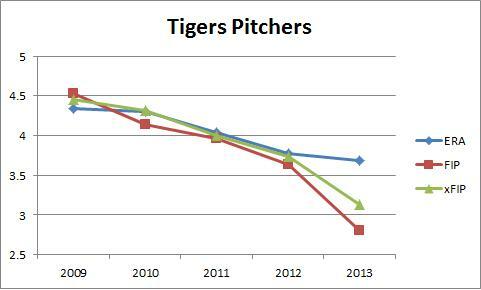 Also of interest to Tigers fans might be yesterday’s post on the team’s increase use of the changeup over the last few seasons. The Moment: Fister makes a diving stop in the 6th. Fastball velocity catches your attention. Knee-buckling breaking balls demand respect. But the changeup is not usually a pitch that grabs headlines, but here I am, writing about it. 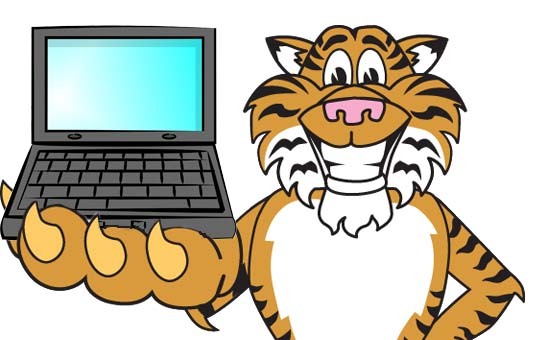 I’ve mentioned it briefly in these electronic pages and Rod Allen has touched on it as well: the Tigers are throwing more changeups and it’s working. 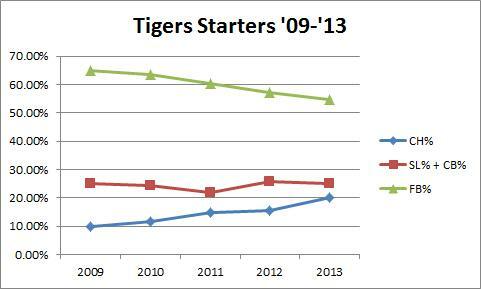 Now I’m not sure if this change is coming from Jeff Jones, the Tigers pitching coach, or Jim Leyland. Maybe it’s coming from Alex Avila. Perhaps the starters are doing it themselves and learning from one another. Heck, the front office could be putting useful information about the pitch in front of the players. I don’t know the answer, but I know it’s happening and I know it’s yielding some good results. 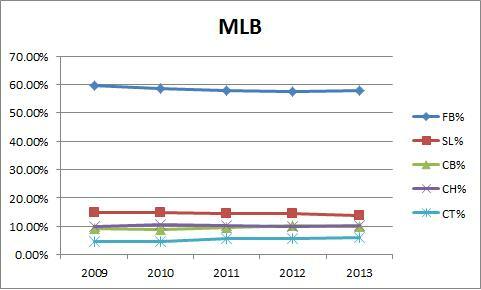 This allows you to see the trend a little better. 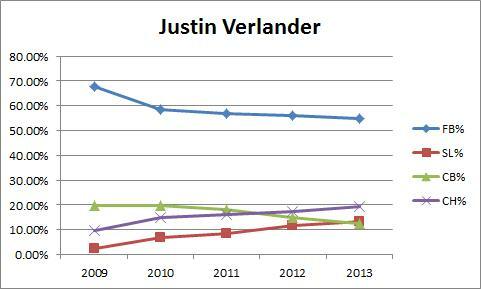 Fastballs down, changeups up. Breaking balls mostly constant (splitters, cutters, knucklers all excluded due to very low numbers). So is this an overall trend that reflects a difference in organizational approach, or is one pitcher getting changeup happy and obscuring the results. (The size of the scale on the vertical axis makes these changes look minor, but we are talking about noticeable changes). Twelve graphs later, what have we learned? Well we can see that the Tigers starters are collectively and individually moving toward changeups at the expense of the fastball, while also shifting which types of breaking balls they throw. 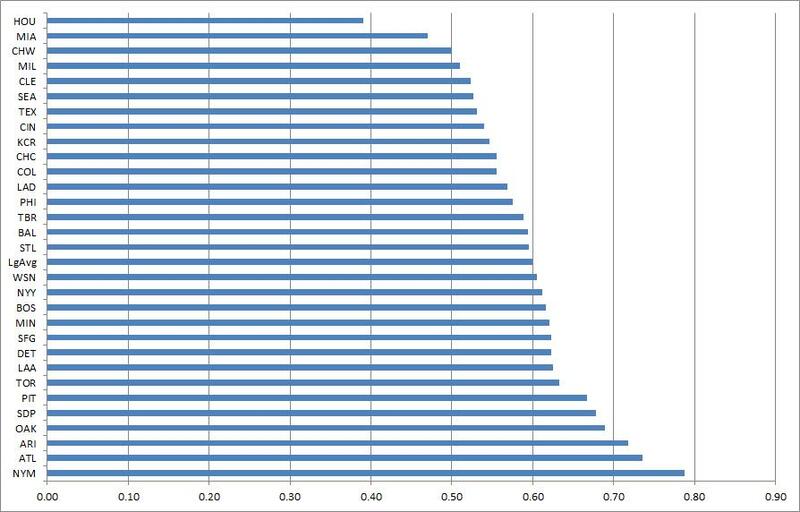 I’m not sure if this change in approach is coming from the pitching coach, the catcher, or the pitchers themselves, but the trend exists and it’s hard to argue with the staff that has 4 of the top 12 pitchers by WAR so far in 2013 and leads the league by more than 3 full wins as an entire pitching staff. 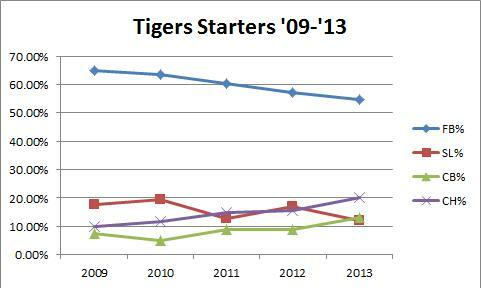 The Tigers are throwing more changeups. I’m not sure whose idea it was, but it’s working and it isn’t happening in all 30 major league cities. Changeups aren’t usually thought about as a “stuff” pitch, but it might be time to rethink that approach. I know there are some advocates for the pitch, like Dave Cameron at Fangraphs, who like me, thinks great changeups are vastly underappreciated, but on the whole, we overlook the changeup. Maybe we shouldn’t. Has the Cardinals draft team been tested for PEDs? You can see 60% is about average and the Mets lead the way with 79%, but look at those Astros. My, my those Astros. 39%. Very good, and then it totally unraveled. This game can be thought of as a two act play. The first act got rave reviews as the Tigers jumped out to a 3-1 lead thanks to a three run 5th and a great start by Anibal Sanchez (5-5, 71 IP, 2.79 ERA, 1.87 FIP, 3.1 WAR). But in the bottom of the 7th, this would be the start of act two, the Pirates jumped on Sanchez so quickly he didn’t know what hit him. They got 4 runs on 5 hits and a walk in the inning to chase Sanchez with a final line of 6.2 IP, 7 H, 5 R, 1 BB, and 9 K. Now trailing by two the Tigers made a run at a comeback, but ultimately came up short and will need to win tomorrow behind Doug Fister (5-2, 61.2 IP, 3.65 ERA, 2.89 FIP, 1.8 WAR) to split the four game, home and home series, with the Pirates. The Moment: Cabrera smacks an opposite field bomb in the 5th. In case you missed it, last month we launched our Dynamic Standings Projection feature on New English D. A full explanation of the methodology can be found here or by clicking the tab at the top of the page. This project seeks to provide a reasoned and cautious approach to updating our beliefs about the baseball future. You can find a summarization of the original projections here. You’ll notice a column on the far right that indicates the difference in projected wins from the preseason prediction. Positive numbers mean teams are now projected to win more games and negative numbers mean a team is now projected to win fewer games. This Dynamic Standings Projection is updated through the May 28 games. How do you like some of these home and home series in MLB? Baseball as it should be, with an unfortunate ending. I’ve been banging the Rick Porcello (2-2, 51 IP, 5.29 ERA, 3.93 FIP, 0.7 WAR) drum pretty hard for a long time, and as recently as two weeks ago, and it was so much fun to watch him walk out onto the mound after a rain delay tonight and deliver the best performance of his career. He was brilliant from the start and finished with 8 innings, 3 hits, 0 runs, 1 BB, and 11 K. Only two balls were hit in the air against him all night, both of which were caught. The three hits were groundball singles up the middle. Nothing else of any substance came off the bats of the Pirates hitters and Porcello (as you can see below) continued his march toward his breakout year. For their part, the Tigers offense made him sweat and didn’t deliver anything, even into the 11th inning, when Neil Walker’s solo HR gave the Pirates a 1-0 lead that would hold.The loss gives the Tigers a 4-2 homestand and a 29-21 record so far on the year as they pack up and head to Pittsburgh to play the second half of the home and home series. Anibal Sanchez (5-4, 64.1 IP, 2.38 ERA, 1.78 FIP, 2.8 WAR) will start game one Wednesday looking to continue his great season and keep his near no-hitter stuff going. The Moment: Porcello strikes out his 11th batter to set a new career best. 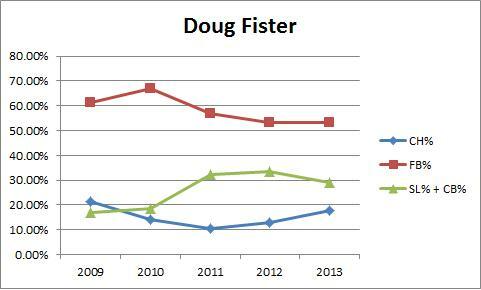 His best offensive season was 2005, when he was 23, and his second best was in 2011 when he was 29. At 31, he is making a run at his best season yet. So far, he’s hitting .341/.392/.500, 139 wRC+, 2.1 WAR (195 PA). 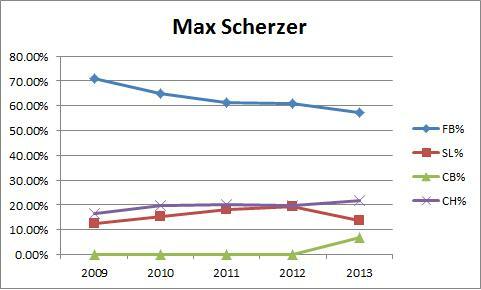 If we assume he will play 150 games based on career norms, he is set to accumulate career best 7.0 WAR. But he likely won’t keep up this pace because this is a borderline MVP pace and he’s never done that before and players generally don’t get significantly better after age 30. A player’s performance is also not uniform over an entire season and it would be wrong to assume he will play at this pace for the rest of the year simply because that would be unlikely even if he did get tangibly better. One of the reasons Peralta isn’t going to keep this up is because he has a very high, unsustainable Batting Average on Balls in Play (BABIP), which is a statistic we associate with luck. 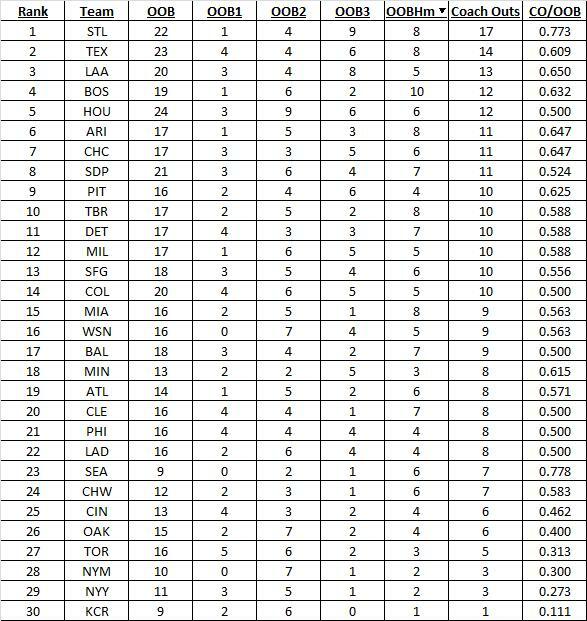 The standard BABIP rule of thumb is that .300 is where you expect most players to converge toward, with better hitters maintaining numbers in the middle .300s. The idea here is that when you put the ball in play, you only have control over how hard you hit it and the precise location is outside of your control. Sometimes you’ll smoke a baseball and it will be caught and sometimes a bloop hit will fall. In general, these take a a couple thousand plate appearances to balance out. This is not to say that hitters can’t influence their BABIPs with their approach and talent level, but rather that BABIP will regress toward a player’s career norm and that small sample BABIPs can lead you to make mistaken predictions. 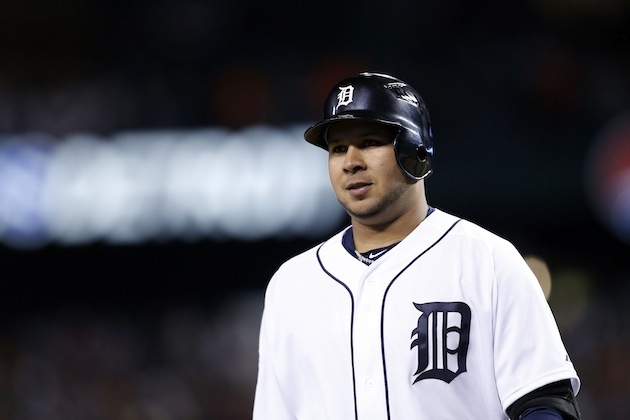 Jhonny Peralta’s BABIP in 2013 is .414. That’s very high. His career BABIP entering 2013 was .310, meaning it is unlikely that Peralta will be able to maintain his high BABIP, and with it, his current level of production. 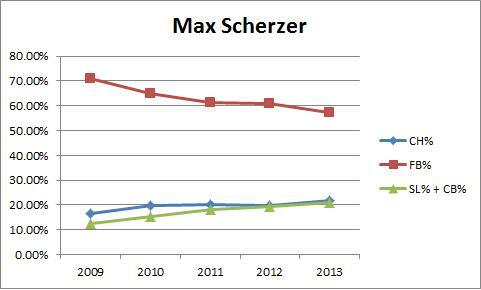 It’s possible that he got better, but it is not possible his true talent level is now a .414 BABIP. The highest BABIP among active players is .367, with a number of the games’ best hitters in the .330 to .360 range. The highest modern day BABIP is Ty Cobb, coming in at .378. 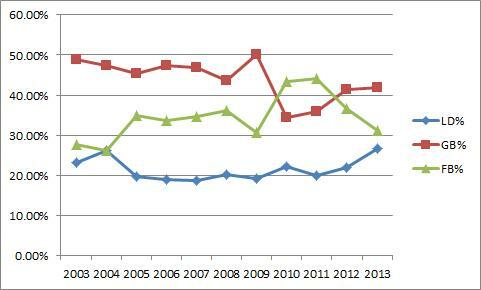 League average BABIP for non-pitchers over the last 10 years hovers between .294 and .305. This is all by way of saying that Peralta’s early season success isn’t around to stay. 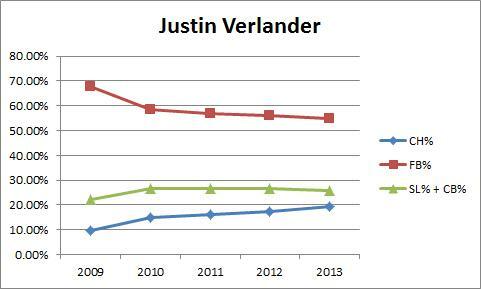 He’s still very capable of having a great year, but it isn’t going to look like this, don’t fool yourself. Well, then I thought to myself, perhaps I’m missing something. 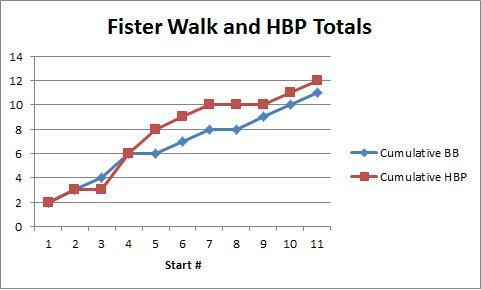 Perhaps Peralta’s good BABIP luck is hiding an actual improvement in his skills. Maybe he’s gotten better and luckier in his 31st year on Earth. 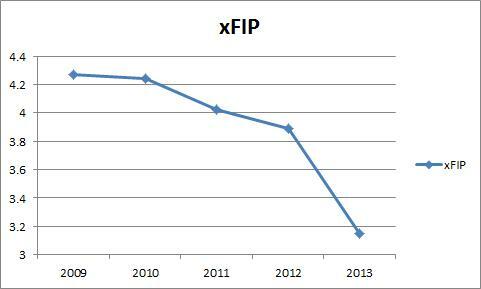 If you erase the BABIP increase, he’s pretty much the Jhonny Peralta you knew. 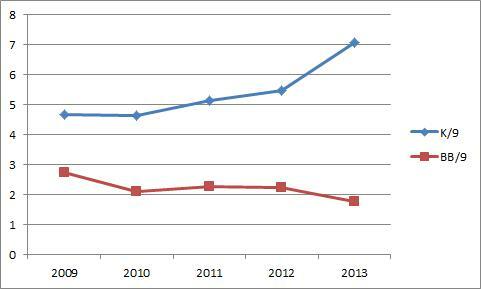 So how much, if at all, is the BABIP increase a change in skill? Peralta is hitting more line drives and more groundballs at the expense of hitting the ball in the air. This is important because line drives and groundballs are more likely to go for hits than flyballs, which could actually make his BABIP shift reasonable in direction if not in magnitude. In other words, the balls are coming off Peralta’s bat this season on a different trajectory that they did in the past. This could be something. 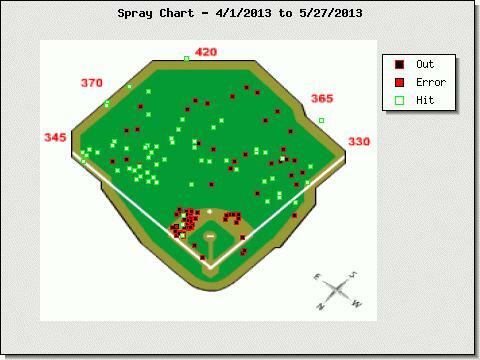 What we see here is that as Peralta has changed as a hitter, he has started to get hits to right field. Everyone knows that. He’s definitely learned to go the other way, but what is also striking to me is that he is also making fewer outs in the air to left field. He’s making fewer outs in the outfield period. He’s getting a band of hits in front of the outfielders in a way that didn’t happen in 2010. So while Peralta’s numbers this year are great, his high BABIP means he’s not going to keep up this pace. But if you look at the batted ball data, you can see that he changing the way he makes contact to some degree and is inducing different trajectories off the bat. He’s not a 7.0 WAR player like the pace indicates, but there is reason to believe that if he continues to impress the defensive metrics, he may hit well enough to approach another 5.0 win season.